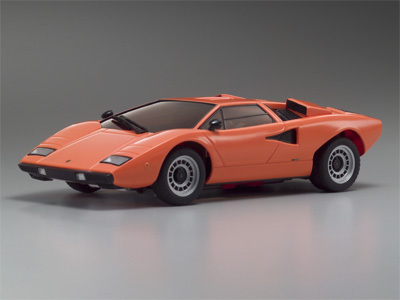 Kyosho Mini-Z Lamborghini Countach LP400 MR-015 RML GlossCoat AutoScale Body - Yellow. Kyosho has come out with my dream car here. This ASC is a must for my collection. The best part is it look's low and solid, with very few parts to break off. It should look nice tearing around any track. The Countach has always been my favorite Lamborghini, I can hardly wait for the LP 500 for the MR02 chassis. The only thing better would be if Kyosho offered these in the unpainted "white" sets, as I have a ton of ideas for those.